Complete raw nutrition specifically formulated for small breed dogs. Made with premium cuts of selected beef. 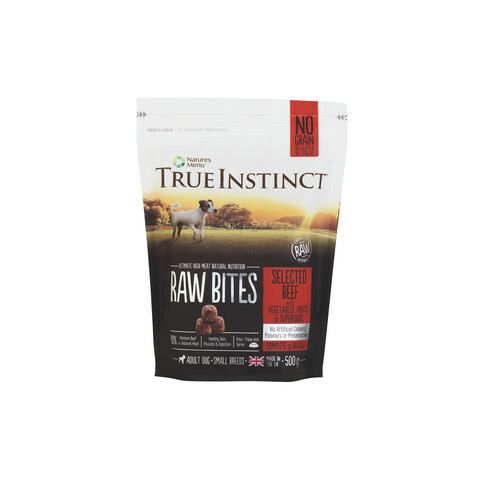 True Instinct raw dog food contains minimally processed deboned meat and organs, with vegetables, fruits and superfoods, in a smaller bite for smaller mouths. Just thaw and serve. Beef (80% including Deboned Beef Meat 26%), Carrots (5%), Apples (5%), Pea Fibre, Dicalcium Phosphate, Butternut Squash, Sweet Potato, Beet Pulp, Cranberries, Blackberries, Flaxseed, Kelp, Chicory Root, Kale, Coconut Oil, Peppermint, Green Tea (0.05%), Yucca, Rosemary (0.04%), Parsley (0.03%), Dandelion Root (0.15%), Hawthorn Leaf. Protein 12%; Crude Oils & Fats 10%; Crude Ash 3%; Crude Fibres 1.5%; Moisture 66%. 153 kcal/100g, Vitamins: Vitamin A 1,000IU, Vitamin D 100IU, Vitamin E 14mg. Trace Elements: Zinc sulphate monohydrate 50.1mg, (Zn 18.3mg); Ferrous sulphate monohydrate 20mg, (Fe 6mg); Cupric sulphate pentahydrate 7.2mg (Cu 1.8mg), Calcium iodate anhydrous 0.4mg (I 0.26mg); Selenised yeast inactivated 8.6 mg (Se 0.02mg).